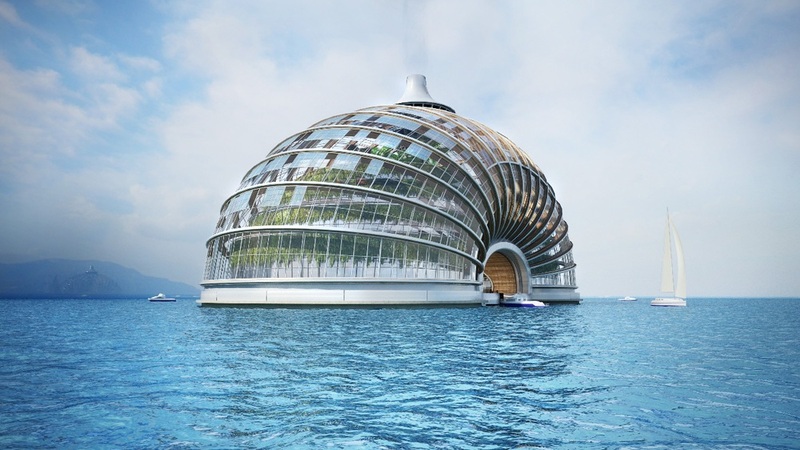 Taking inspiration from the vessel that Patriarch Noah uses to save himself, his family and two of every animal species known to man from a devastating flood, Russian design studio Remistudio has designed a quite phenomenal floating ‘biosphere’ hotel concept named ‘The Ark’ that could withstand epic natural disasters of Noah proportions. A safe haven of quite epic stature, the shell-shaped, modern-day Ark was designed by the studio in connection with the International Union of Architects' program 'Architecture for Disaster Relief'. In theory, the floating structure would be built to withstand floods caused by our rising sea levels, massive tidal waves and even earthquakes. Compressed timber arches and high-tension steel cables provide the structure with a structural solidity befitting of its purpose, and the framework itself is covered by a special foil made of EthylTetraFluoroEthylene (ETFE); a strong, highly transparent, light, self-cleaning, durable and cost-efficient alternative to glass. 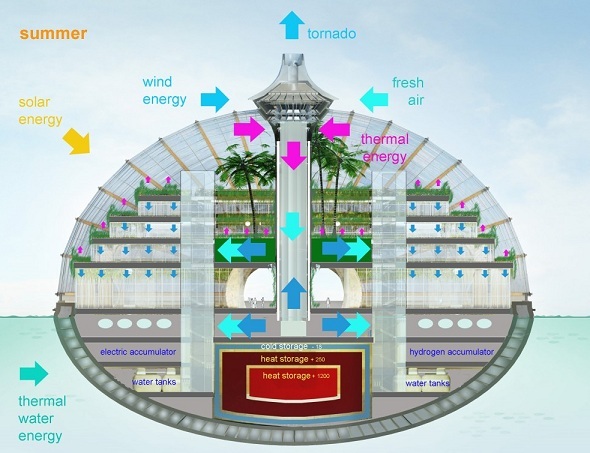 Also a self-sustaining paradise of sorts, within its greenhouse-like environment is housed lush vegetation and organic life, improving the quality of air as well as providing food for the hotel’s guests, and a veritable smorgasbord of intelligent (and 'green') independent life support systems. The Ark's shape not only makes it a perfect fit for installing solar cells at an optimal angle toward the sun, but also assists in the collection of warm air at the upper level, where the energy accumulated is later stored in seasonal heat accumulators in order to provide an uninterrupted energy supply. Heat from the surrounding water, ground or air is also recycled, and a rainwater collection system creates surplus power and provides clean drinking water for inhabitants. Unlike Noah's creation, Remistudio's conceptual structure can be constructed to sit in the sea or on drier land. Factor in even slight alterations to its form factor and The Ark could theoretically be adapted to suit any climate on Earth. One thing's for sure: when the time comes, we want a place to stay.